This has to be one of the greatest days that anybody has ever had. I'm on the beautiful roads outside of Cascais, Portugal, and started my day off with a blast around some lovely roads atop the new Triumph T120 Bonneville. That by itself is a great recipe for a great day. But then, by the time we were done with the new Bonnie, it was time to ride this thing you see here  the Triumph Thruxton R.
Simply put, it is the stuff that every retro boy racer's wet dreams are made of. A 1,200cc, parallel twin motor combined with an all-new chassis and parts that come from the makers of the most trick bits for racing machines. All of this come together to make this machine something that requires buckets to collect all the drool in. Hey waiter, may I have another paper towel, please? I mean just look at that thing. I've always had a thing for the Ducati Sport1000, but unlike that Ducati that came in at the wrong time, the Thruxton arrives just in time to satiate the hunger for retro that is the hot trend right now. It is painfully beautiful. Everything from those bar-end mirrors to the shapely tank and the purposeful golden bits from Brembo, Showa and Ohlins all come together as a motorcycle that you would want to park in your living room as a showpiece as much as you would want to ride it. But please don't park it in your living room if you ever buy one. Because if you do, I know a lot of people (including myself) who will hunt you down and make sure you have a painful death. The Triumph Thruxton R is a motorcycle that deserves to be ridden and appreciated for the way it can be ridden. The way it makes power, for example. 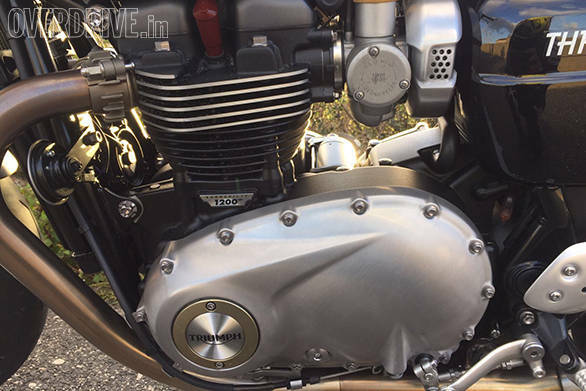 While the motor is identical in displacement to the T120, that is the only similarity between the two  the Thruxton and the Thruxton R use the same 1,200cc, parallel twin with eight valves and a SOHC (both the Thruxton and the R run the same state of tune). The engine itself is called the 1200HP (high power) and runs a higher compression ratio of 11.0:1 compared to the T120's 10.0:1. It also gets a lighter crank to help it rev quicker. 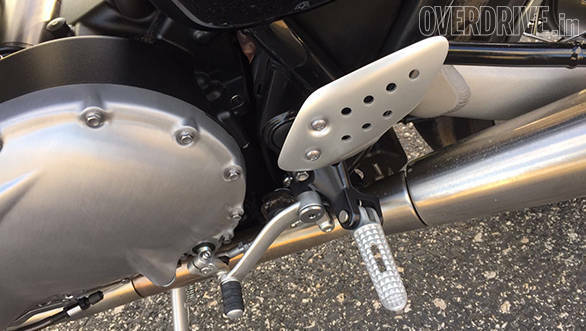 There is also a larger air box, Thruxton specific ECU mapping with an increased rev limit and a high-flow exhaust system. 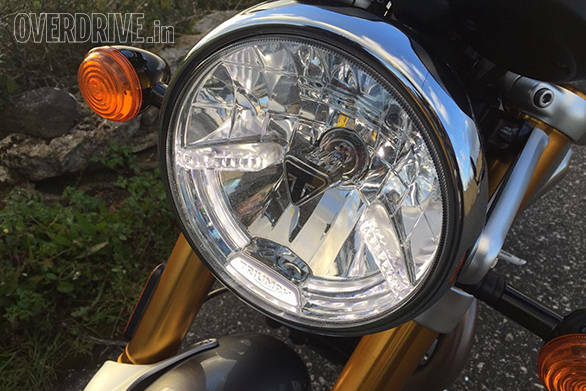 With these changes, the Thruxton makes 97PS and 112Nm of torque. That's 41 per cent more power and 62 per cent more torque than the previous Thruxton. But like the Street Twin and the T120, Triumph's focus was not on making a high output motor that made all of its power up top and was best suited to the racetrack. 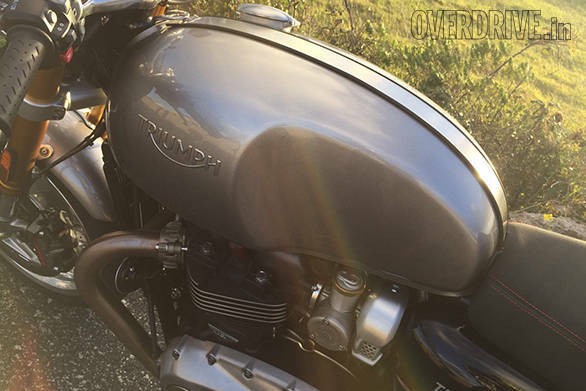 Triumph wanted to create a Thruxton that will deliver great real-world performance. For this they made sure that there is a good spread of power and torque throughout the rev range. 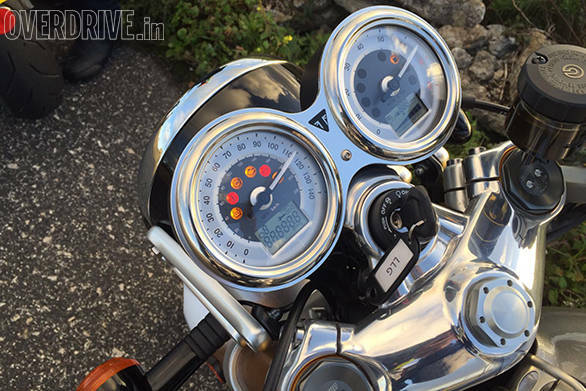 In fact, the Thruxton makes upwards of 100Nm of torque from as low as 2,500rpm. 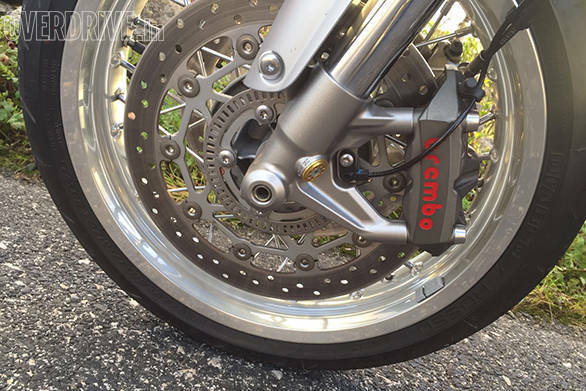 It is this torque that makes the Triumph Thruxton R such a joy to ride. 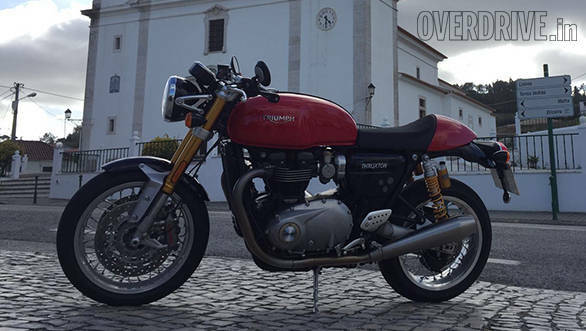 Mated to the new 6-speed gearbox, the Thruxton is quick from standstill. In fact, it is so quick that unintentional wheelies are quite the norm. The power delivery is instant as is progress in any gear. The performance is such that this motorcycle might actually need the host of electronics to keep your behind on the saddle. The Triumph Thruxton and the Thruxton R get ride by wire, three riding modes, switchable traction control and switchable ABS. 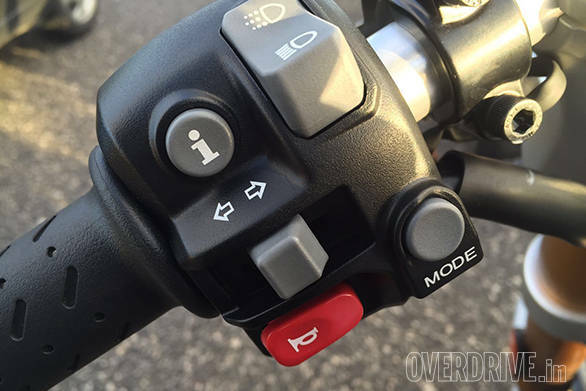 The riding modes  Rain, Road and Sport  vary the throttle maps to give you an aggressive or gentle response. In Rain, the motorcycle is a puppy dog while Road is, well, sporty. The Sport mode though is quite aggressive with every twist of the wrist being rewarded by instant acceleration that results in your head being thrown back if you're not expecting it. That said, the different modes do not affect the power output in any way, and the Thruxtons deliver full power throughout - something that makes you grateful for the existence of traction control. It isn't the most seamless unit, but it isn't too intrusive either. It cuts in the way a dirty carburettor causes a power drop. What I mean is under flat out acceleration you can feel the traction control cutting in to arrest wheel spin and uncontrolled wheelies. As we all know, straight line performance is great, but no motorcycle can be called truly incredible if it doesn't go around corners. And this is where the Thruxton R stands out. While the Thruxton makes do with standard-spec Kayaba forks and dual rate shocks at the rear, the R gets the best of the best. 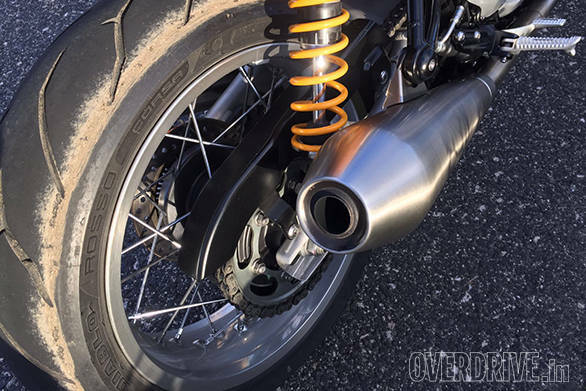 It runs fully adjustable Showa big piston forks up front and dual, fully adjustable Ohlins shocks at the rear  both finished in that lovely shade of gold that I love so much. The bike also runs on 17-inch, lightweight, aluminium wheels at either end wrapped in the lovely Pirelli Rosso Corsas. The R also gets radially mounted Brembo brakes with dual floating discs up front and a single rotor set-up at the rear (again Brembo). Let me just go ahead and say this  the Thruxton R is the best handling retro classic out there. In fact, I will even go as far as saying it can run circles around a lot of contemporary sportsbikes. It handles so well, this thing. Like the T120's highlight, for me, was the refinement and smoothness, the Triumph Thruxton R's highlight is the way it goes around corners. Between the T120 and the Thruxtons, Triumph has decreased the headstock angle, reduced the trail, and used a shorter aluminium swing arm to reduce wheelbase and unsprung weight. This has made the Thruxton R super light to steer. 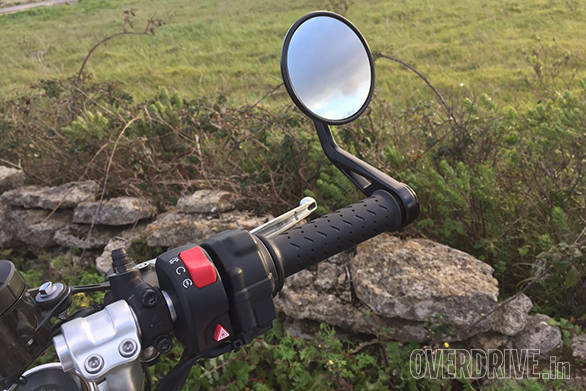 The motorcycle turns in at the drop of a hat but not in an uncontrolled manner. Steering inputs are rewarded with precise changes in direction that bring a smile to your face every single time. In corners, the R behaves as if it is on rails. It tracks the line of your choosing perfectly and never once leaves at a loss for confidence. You trust the chassis so much that within your first few corners, you start going faster than you thought possible. It's really that good. By the time I was back from my ride, the entire rear tyre had been scrubbed and used. No chicken strips at all. And the great thing about this motorcycle is that no matter how hard we pushed it, there was never a moment when you felt unsure. Even over broken tarmac and bumps in the road, the R would do one wiggle and settle back into what it was doing before. Of course, all this handling capability would mean that the ride quality was absolute rubbish. But no. 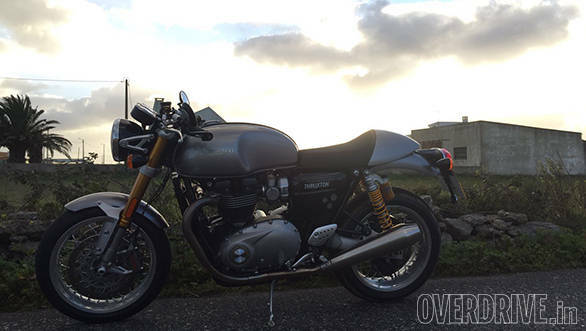 The Thruxton R does run a lot stiffer than the T120, but not to the extent that it breaks your back. The ride quality is stiff, no doubt, but it isn't painful. Most of what the roads around Cascais had to throw at us, the motorcycle absorbed gladly. But hold on, when a motorcycle looks so good, it doesn't really matter does it? The Triumph Thruxton by itself is one of the best looking motorcycles around today. But toss the R into the mix, and it is by far the coolest retro motorcycle ever! The sculpted tank, the Monza style fuel fuller cap, the brushed aluminium finished engine, the Daytona footpegs with drilled heel plates, the clip-on handlebars, the spoke wheels, the golden finished suspension bits, the massive brakes and reverse megaphone exhausts make it one of the most painfully good looking motorcycles to be ever made. And if you want to really bring out the waterworks, just snap on that classic club racer fairing that comes as an optional accessory and weep. The Triumph Thruxton R is everything I wanted it to be. It combines retro cool with the performance of a modern sportsbike. It can set racetracks on fire and look pretty while doing it. It is a track tool, mountain carver and work of art rolled into one. And as one gentleman from Triumph put it, "I might be just as happy parking it in my living room and stroking it every now and then as I was out riding it." But no, please don't leave it in your living room. Because motorcycles like these deserve to be ridden.